While growers in Champagne have historically struggled to ripen their grapes, the biggest challenge facing the region today is preserving acidity levels, according to one family-owned house. “Historically, the main issue in Champagne used to be whether you could get your grapes ripe enough. “Now we don’t have a problem with that and the big issue is acidity levels. The harvest in Champagne is getting earlier each year, which means the acidity levels in the wines is going down. In order to maintain the right acidity level in my Champagnes, I decided to completely block malolactic fermentation this year. “Last year was the first time I did it and I can imagine I’ll have to do it more often in the coming years. I used to partially block MLF, but have completely blocked it in the last two years. It’s a difficult decision to make as when you do it can alter the style of the wine. Malassagne deems any subtle changes in style to be worth it in his pursuit of freshness. “My priority is acidity over sugar levels, so I’m aiming to make base wines with 10.5% alcohol – any higher and the acidity goes down. I’d rather add sugar to my wines than tartaric acid as you get metallic aromas from it,” he told db. “I’m deliberately going for an oxidative style but freshness is really important, which is why my new ‘mag 14’ non-vintage wines contain a proportion of reserve wines that have been aged in magnum under cork and staple. “Climate change is a reality. The challenge for the future of Champagne is to bring as much freshness as possible to our reserve wines. Acidity levels are much lower than they used to be. Reserve wines now need to add complexity and richness but also freshness,” he added. In addition to ageing a portion of his reserve wines in magnum, the reserve wines that go into the ‘mag 14’ non-vintage wines are also aged in 225-litre barrels and 5,000-litres barriques in an ambitious ageing project Malassagne began in 2010. 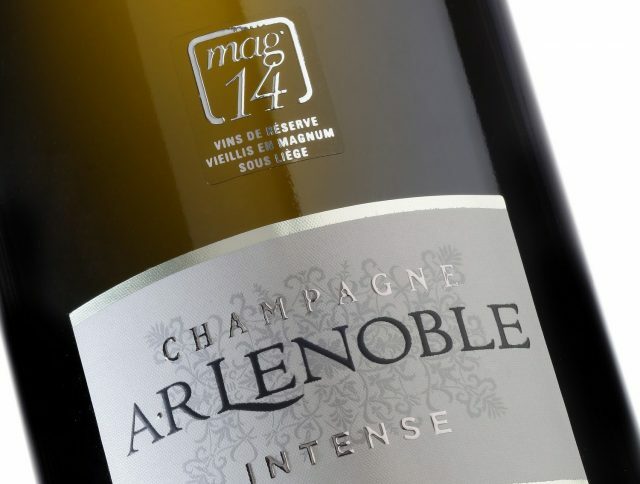 The fruits of the project are AR Lenoble Intense ‘mag 14’ and AR Lenoble Blanc de Blancs Chouilly ‘mag 14’, both of which are aged for three-and-a-half years after bottling before they are released. 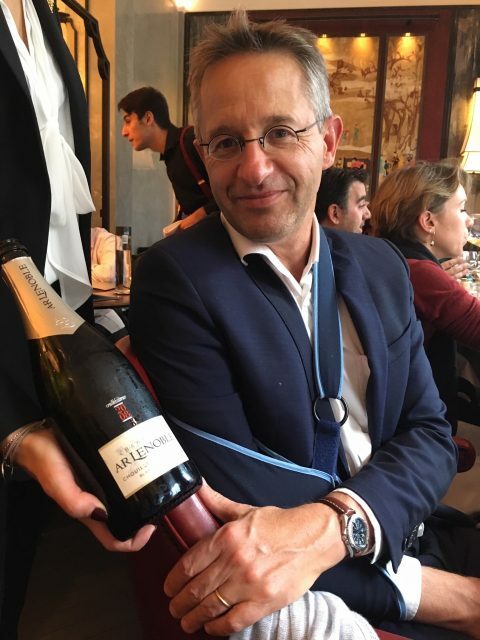 Both wines contain 40% of reserve wines and 60% of wines from the 2014 vintage, though Malassagne says he may use up to 50% reserve wines in the future. “A lot of consumers think non-vintage wines have just been bottled, which is not the case. That’s why we put the number ’14’ on the bottle of our new non-vintage releases, to show that over half of the wine came from the 2014 vintage, which will help consumers to view Champagne more like a wine,” he said. Non-vintage wines account for around 70-75% of AR Lenoble’s output and Malassagne is reducing the amount of vintage wine the house produces. “I’m making less and less vintage Champagne as I’d rather make a top quality non-vintage and only produce a vintage wine when there is something special to say,” he revealed. Having said that, it’s looking likely that 2018 will be a vintage year for AR Lenoble, with Malassagne describing the harvest as “remarkable” both in quality and quantity. He is particularly happy with the Chardonnay, so may focus on a blanc de blancs from 2018. An in-depth look at non-vintage Champagne appears in the October issue of the drinks business magazine. Can use electrodialysis membranes to decrease pH by 0.1 to 0.5.
pH levels going down. That means that the wines are becoming more acidic, not less. And why not just harvest earlier to maintain acidity? It is what is down through Mediterranean and warm continental climates throughout the world. Seems the pH and Acidity has been confused as a lower pH means a higher Acidity (Tartaric and Malic acid, mainly). As grapes ripen the acidity drops and the pH rises. Is it, then, any wonder that UK fizz is making such inroads with the same terroir and much better acidity in sparkiling wine?